Creamy alfredo sauce based Shrimp Scampi Flatbread Pizza. 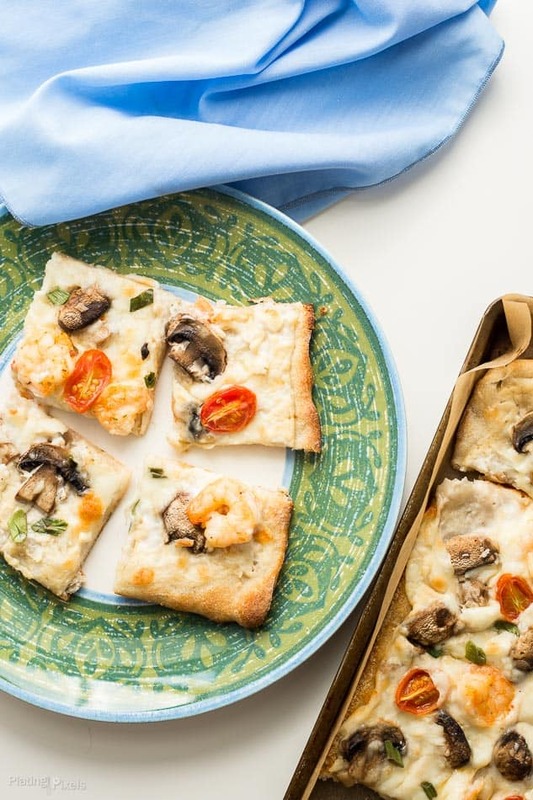 Quick and easy shrimp flat bread with mozzarella, mushrooms, green onion and cherry tomatoes. 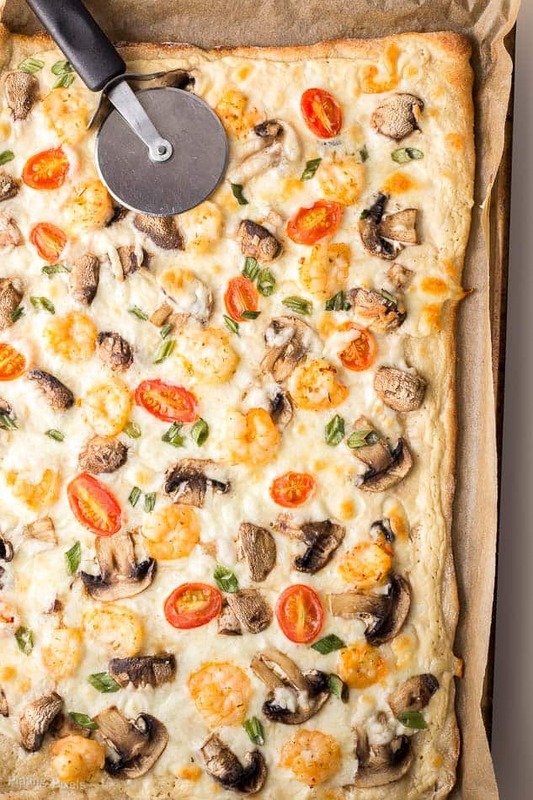 Within this recipe post you’ll make a unique white sauce flatbread pizza and shrimp scampi topping, with time saving shortcuts. Is it a bit bold to say everything is better with shrimp? Take flatbread pizza for example, why not make it unique and turn it into a Shrimp Scampi Flatbread Pizza. Thin crust and lean protein shrimp make it healthier than your standard pizza, without any reduction on flavor. I’m a fan of pizza and shrimp so it was only natural to put them together. You could make your own dough, but to keep things simple for a weeknight meal, I suggest pre-made thin crust dough. Then add your favorite alfredo sauce, mozzarella cheese, fresh mushrooms, green onion and cherry tomatoes. 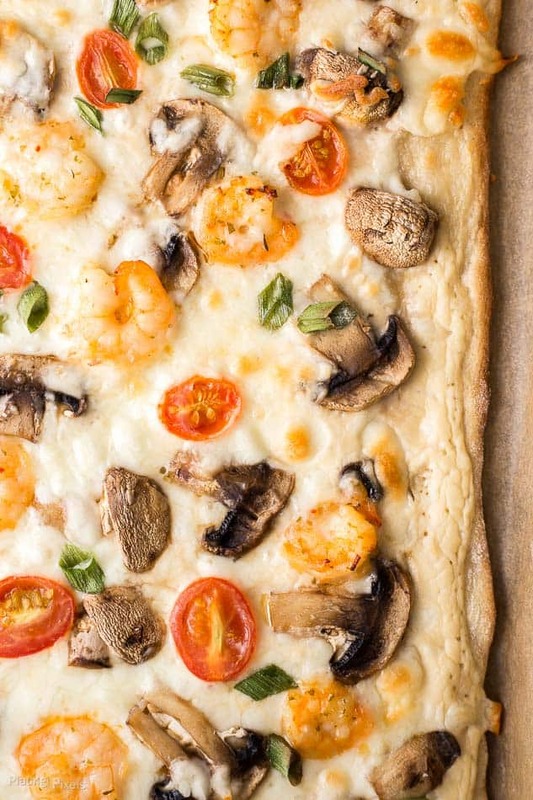 Add one more ingredient (shrimp scampi) to make it 7 simple ingredients for a flavorful flatbread pizza that’s prepped in a matter of minutes. This beautiful rustic-style flatbread pizza has orbs of vibrant red and green colors that contrast the mostly white ingredients. Good for flavor and even better for photography. For added flavor I used SeaPak® Shrimp Scampi. It’s already packed full of flavor and ready to cook. Shrimp scampi has a buttery herb flavor, perfect for pairing with alfredo sauce on a flatbread pizza. Frozen shrimp is a great option as it stores well and you can keep on hand for any recipe. If you like this simple Shrimp Scampi Flatbread Pizza and want more shrimp, you’ll love my Coconut Curry Shrimp. You could add SeaPak shrimp scampi to that as well for added flavor. Flavor profiles: Buttery shrimp paired with cheesy alfredo sauce and fresh veggies. Texture: Crisp and chewy flatbread crust with creamy sauce and tender shrimp scampi. Dietary Options/Substitutions: For gluten-free use GF pizza dough. Quick and easy shrimp flat bread with mozzarella, mushrooms, green onion and cherry tomatoes. Preheat oven to 425° F. Cook shrimp scampi in a non-stick pan or skillet over medium-high heat; stirring often for 8 minutes, or until cooked and opaque white. Remove shrimp from pan and discard excess liquid. Unroll pizza dough on a large baking sheet covered with parchment paper (you can also sprinkle pan with light layer of cornmeal). Evenly spread alfredo sauce over dough, except for about ½-inch on all edges. Top with mushroom slices, sprinkle evenly with mozzarella cheese, then top with cooked shrimp, green onion and tomatoes. Bake flatbread for 12 minutes, or until dough is cooked and cheese is golden brown in spots. Cool slightly and cut into squares. I totally agree – EVERYTHING is better with shrimp 😀 I’m so in love with this pizza, you have no idea! I buy SeaPak’s shrimp scampi all the time, but I typically just add pasta. You’ve taken it a step further and I love it! High five to that. Glad I could provide a tasty alternative use for their shrimp. Thanks Chrisy! 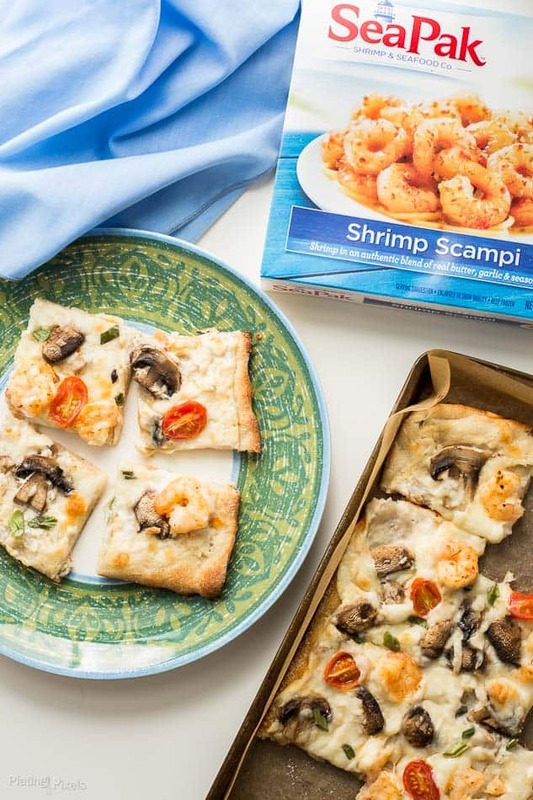 I never would have thought of this but I love flat bread pizzas and I love shrimp scampi so I’m going to give it a try. That looks so ridiculously good! I want to eat the whole thing! 🙂 I love how the crust looks so tender in the photo! I love shrimp scampi, so I bet this is so good! This shrimp pizza looks really great! 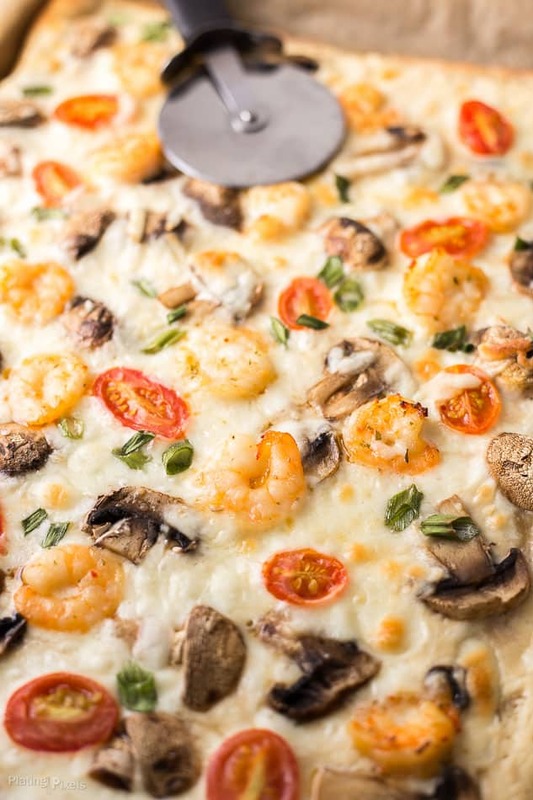 I’ve never thought to put shrimp on pizza~ I can’t wait to try this recipe, thank you for sharing! This was the first time I’ve done and was surprise I hadn’t thought of it till now! Thanks Ashleigh! Whaaaaa?!?! This gourmet pizza and that’s ALL?! I totally love how easy this recipe is. Looks so insanely tasty too! Yep just a handful of ingredients and definitely has a gourmet quality. Thanks Chrissa! Yum! What a fun flavor combo for flatbread pizza. Sounds delicious. My thought exactly. Thanks Emily! I’m not a huge mushroom fan – but this looks amazing! Pizza is one of my favorite things to eat! You could totally omit or replace the mushrooms. Thanks Liv! I am all over this recipe. Pinned it before I even finished reading the post. Will definitely be making this very soon. Looks delish! Haha that’s such a great response. Thanks Yaya and I hope you like it! a combination of my two favorite foods! This looks incredible! I love making my own pizza/flatbreads! Thanks for sharing! They go together so well too! It’s fun to make your own. Thanks Kristen! Love flatbreads, this sounds delicious. Me too and thanks Candy! I’m having leftovers for lunch too! It’s so good with the shrimp scampi. Thanks Cathy! This looks like the perfect appetizer for a girl’s night! It sure would be! Thanks Kari! This looks absolutely amazing! This looks like a great dish to make for entertaining. Thanks for sharing! Perfect for entertaining or an easy meal at home. You’re welcome and thanks Alayna! It soooo is! Thanks Esther!